U.S. Rep. Joe Kennedy III, D-Mass., has ruled out a 2020 presidential run, despite being the subject of speculation. “I’ve got enough on my plate,” the three-term House member said on ABC News’ “Powerhouse Politics” podcast. “I actually am one of those folks that encourage a big, broad field and that’s because I think we are at a time our country is in a transition, economically, societally, culturally,” Kennedy told Chief White House Correspondent Jonathan Karl and Political Director Rick Klein. Given that he’s not running, Kennedy said he’s open to endorsing the right candidate. One presumed Democratic candidate is the senior senator from his state, and his former law professor, Elizabeth Warren. Warren has come under fire recently for claiming a Native American ancestry. A DNA test she took proved otherwise and she’s since publicly apologized. She faced new fallout Wednesday after the Washington Post reported that on a 1986 registration card for the State Bar of Texas she identified as “American Indian.” It prompted another apology. On the subject of the current executive branch, Kennedy said he was largely unmoved by the president’s State of the Union address. “I thought it was not unlike the speech that he gave last year,” he said. 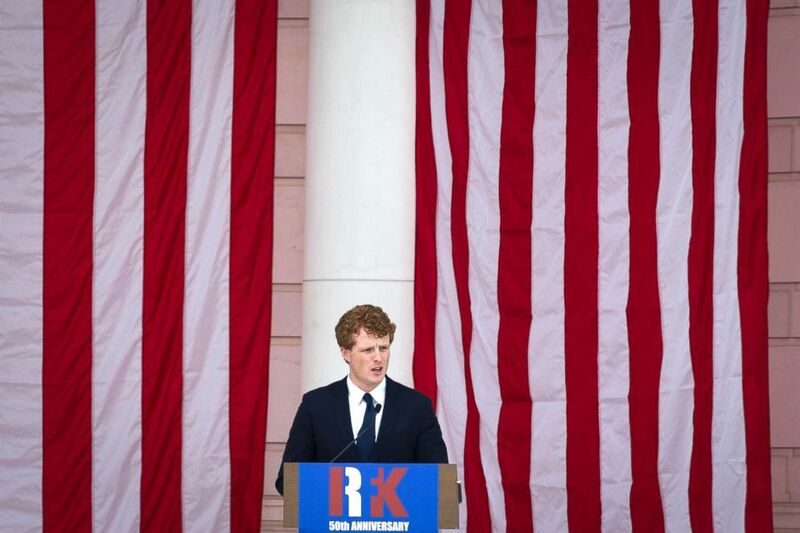 Rep. Joe Kennedy III speaks during the Robert F. Kennedy memorial service at Arlington National Cemetery in Arlington, June 6, 2018. He has proven over and over and over again to be, at best, unreliable and, at worst, somebody that doesn’t have a real desire to keep his word. Words from Trump don’t hold much weight, according to the congressman. “He has proven over and over and over again to be, at best, unreliable and, at worst, somebody that doesn’t have a real desire to keep his word,” Kennedy said. He highlighted the need for Trump to compromise, especially with the chance of another government shutdown looming. Kennedy watched Trump’s address from home since his wife had broken her ankle. This was the second time he was not in attendance, as he gave the Democratic response last year. His response was generally well-received, though there was public comment about how shiny his lips appeared. Kennedy attributed it to an overly liberal use of lip balm. He praised Stacey Abrams, who gave this year’s Democratic party response. Every Wednesday, ABC Radio and iTunes bring you the “Powerhouse Politics” podcast, which includes interviews and in-depth looks at the people and events shaping U.S. politics. Hosted by ABC News Chief White House Correspondent Jonathan Karl and ABC News Political Director Rick Klein.